On May 3, 1971, at 5 p.m., All Things Considered debuted on 90 public radio stations. In the 40 years since, almost everything about the program has changed, from the hosts, producers, editors and reporters to the length of the program, the equipment used and even the audience. 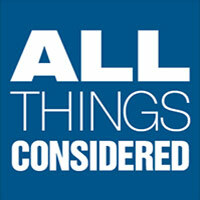 All Things Considered is the most listened-to, afternoon drive-time, news radio program in the country. Every weekday the two-hour show is hosted by , and . In 1977, ATC expanded to seven days a week with a one-hour show on Saturdays and Sundays. During each broadcast, stories and reports come to listeners from NPR reporters and correspondents based throughout the United States and the world. The hosts interview newsmakers and contribute their own reporting. Rounding out the mix are the disparate voices of a variety of commentators, including Sports Commentator , Poet and Political Columnists and . All Things Considered has earned many of journalism’s highest honors, including the George Foster Peabody Award, the Alfred I. duPont-Columbia University Award and the Overseas Press Club Award.